A grand inception to a multi-billion dollar event! CSK brushes past KKR by an astonishing 2 runs to open their account on a bright note and set alight the cricketing extravaganza. Now the action moves to Kochi, which will host it’s first floodlit encounter between it’s namesake team and the Bangalore Boys. Kochi Tuskers Kerala (KTK) is the new kid on the block and will be raring to give a go on the more fancied and attractive Bangalore outfit, which will be led by the nerdish student yet charming personality in Daniel Vettori. The cricket fever has gripped the city three-fold with the fans rooting for their very own enterprise. A tumultuous day awaits the Kochi Police Force with duties round-the-clock on a day where the city will transform into a buzzing hive as dignitaries, processions hit the streets marking a historical day here. Young leader-in-the-making Rahul Gandhi is proposed to make a visit to the city due to election commitments and this will be the first real test for the men-in-control. Thank goodness he’s opted out of the idea of watching IPL here, otherwise the police would have sported a mourning look. A cavalcade honouring demised apostolic philanthropist, Mar Varkey Vithayayhtil, will pass along prime centres of Kochi and here too the police will be kept busy. A procession involving Mata Amritanandamayi will also keep the police on their toes and not to forget their final agenda on the list, the Jawarharlal Nehru Stadium, Kaloor. The match-tickets, however, has not had smooth sales with the public expressing cold response to the decision of local bodies to set up ticket-distribution offices only at select places. And my word! The rates are not feasible for the common man and a possibility of a full-capacity stadium is a big question mark. The government has done nothing by waiving 18% of entertainment tax with the ticket-rates still at a high cost. And the weather-forecast too sounds unfavourable with chances of light showers looming large. Such has been the story of Kochi for the past few days but the cynosure of all attention will be on the 22-yard strip which will be the center of activity. 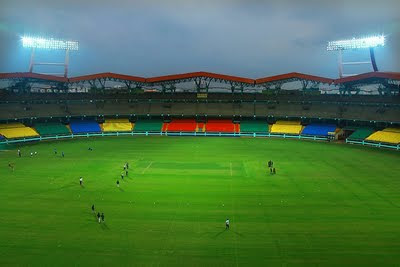 KTK with an experienced line-up will surely pose a gigantic threat to RCB, while the former won’t find it easy also. The very presence of Mahela Jayawardena, the KTK captain, will charge the team to put up a fighting display. Batting prowess in Brendan McCullum, Brad Hodge and Parthiv Patel will cut out the tasks of the RCB bowlers. However the inclusion of Indian ODI reject, VVS Laxman still waits to be seen. Domestic talents in Kedhar Jadhav, Yashpal Singh, Raiphy Vincent Gomez will fight for the remaining spots. The bowling looks exceptional in old warhorse Muttiah Muralitharan, RP Singh, Ramesh Powar and local boy, Sreesanth. The form of Sreesanth may lead the team management to think about a potential replacement for the speedster. With class players in Michael Klinger , Owais Shah and Jayawardena , KTK will look to stamp their authority and make sure the team puts up a splendid performance. RCB, clearly, is the stronger team on paper with players of different quality and dimensions. Led by a skipper who isn’t new to the scene, Daniel Vettori believes his team will go all out to spoil Kochi’s party. Dilshan , AB De Villiers and young superstar Virat Kohli make up the crux of the batting. Another rising star, Saurabh Tiwary is sure to book his place in the team after his fabulous showing in the previous IPL for Mumbai Indians. They have a situation-palyer in Chetashwera Pujara and explosive material in Australian, Luke Pomersbach. The bowling has the likes of Indian spearhead, Zaheer Khan, who had a remarkable WC and Dirk Nannes who is fast and nippy and can provide early inroads into KTK’s batting. Abhimanyu Mithun seems an obvious choice for third seamer but his Ranji team partner, S Aravind too is knocking on the door loud and hard. With Vettori’s crafty spin, RCB is strong favourites to emerge victors today but with the problems KTK has gone through all this while, the Almighty might have a soft-corner towards them. But, the cricket being Twenty20, one can’t predict anything, even the best of cricketing minds.